Here's a PM sent by dumb scammer "HRH Prince Michael Sheffield"
Mr Alan Jones I 'am not a scam artist there is a misunderstanding about your post I have a client that wants to buy copper sheets I also have a letter of intent from my client. I have lots of clients that request different commodities. I never scammed anyone in my life of doing business. Im coming to you man to man so please remove this post Alan Jones. When asked which royal family he was a member of, he replied with a copy and paste of details of the UK Royal Family. Why would a legitimate financial services company have no phone numbers on their website and register their domain using privacy protection? The answer is, they wouldn't, only scammers who want to hide who/where they really are do things like that. 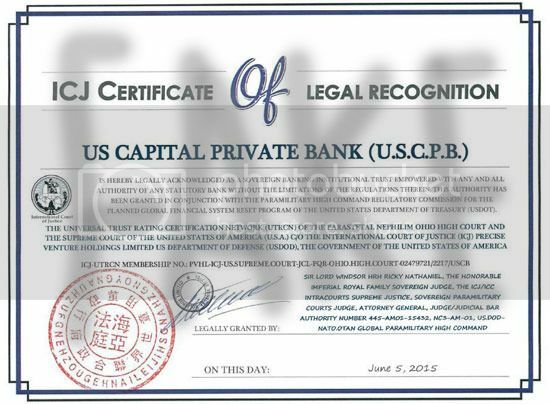 U.S. Capital Private bank Cash/Assets for Project Funding. Profile Original & Official® ¦¦¦¦¦¦¦¦¦¦Private Banking & Wealth Management. One World Media, Focusing on Feature Film Production, Record label, Internet Station and Entertainment Promotions and Financing. "HRH Prince Michael Sheffield" does not appear anywhere else on the Internet except that fake LinkedIn profile - a real member of the UK Royal Family would appear in court circulars and other publications. Another PM from deluded moron HRH Prince Michael Sheffield"
His style of writing gives him away as a barely literate, lazy, good for nothing scammer, rather than a member of British Royalty. 10 year infinity with 8.8 % coupons for 75 plus 2 direct from bank. We are also offering Cash Backed BG / SBLC's 1 year and 1 month with rolls and extensions AAA rated 30+3 direct from bank no broker once engaged in the transaction. Must show POF and ATV. Partial payment final payment due in 5 banking days. Email us for more info. Not a lease instrument unrestricted for all transactions. You are correct, we do not have any proof that you actually scammed anyone. I’m sorry that you were identified as a scammer on Scamwarners.com. The real fact of the matter is you are a liar and your bank / investment company is a fake. You claim on your website to be a financial institution yet it is not registered with any legitimate government banking authority in the countries where you claim to do business. The small matter of you claiming to part of the UK royal family appears to be another bogus claim of yours. You offered to send me proof that your bank is registered and real. You no longer need to send your fake documents because if already found them on the internet. If I can be of any further assistance to you, feel free to contact me. His fake International Court of Justice website. Find out how BIO-RENETICS CUSTOMERS USE BIO-RENETICS TO regulate their blood sugar levels. BIO RE -NETICS HEALTH NOW! The Fake Prince of Singapore appears to be very confused about who his family are. On his Facebook, he has a link to his father, who works construction in Atlanta Georgia and his mother, who lives in Jersey City, New Jersey and was born in 1957 (making her older than the woman he claims is his grandmother ). I'm guessing that due to his low intelligence, he can no longer tell reality from the lies that he is telling the victims of his scams. Please share this on your network for Global Economic Recovery! Proceeds to be used for putting people back to work. GOLD BACKED MTN 8.8 % ANNUAL coupon fixed payment. AAA RATED. 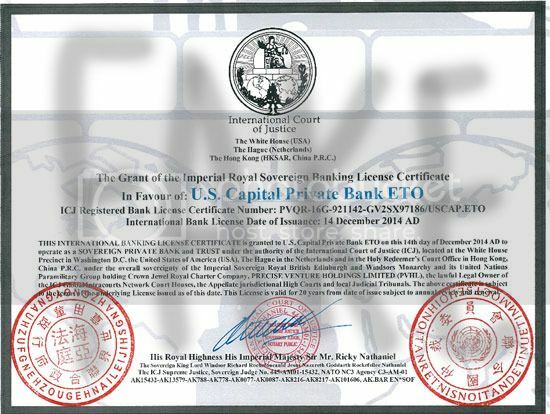 U.S. Capital Private Bank, We would like to welcome you to opening an offshore account with us. Once your account is opened we will immediately fund it with 500M to 800M cash funds to be used for blocking in your favor for a transaction. Register to our private placement platform . Office: +852 5349-3346 - please schedule all calls by email to [email protected] email is the best form of communication please use it.